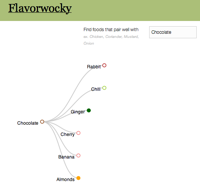 Learn all about Flavorwocky, an amusing name for a clever idea that highlights the connectedness of everyday life. With a little bit of coding, the simple idea about related flavors became Luanne Misquitta’s winning entry for the Neo4j Heroku Challenge. What was her recipe for success? 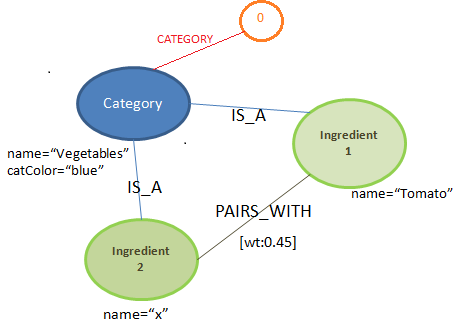 Luanne elaborated on the idea, realizing that “a graph is a good fit for this domain, so, using Neo4j, we model the way ingredients in a great dish pair together based on their flavor affinity.” Sketching out the domain was easy, translating directly into the graph. There are high-level Categories for groups like vegetables, spices, and dairy. Ingredients are related to the category first, then to each through a weighted PAIRS_WITH relationship. For convenience (anticipating the fun visualization) the Categories also have a color property. To implement the application, Luanne decided on Grails 2.0, using straight-up REST calls to Neo4j. Her husband Aldrin has a nice blog post detailing how to get started with a project using Neo4j+Grails running on Heroku. To provide a nice user experience, Luanne turned to the d3.js library to visualize the related ingredients. Agreed, Luanne. It’s insight like yours that inspires new possibilities. Thanks for sharing your work, and congratulations on winning the Challenge.